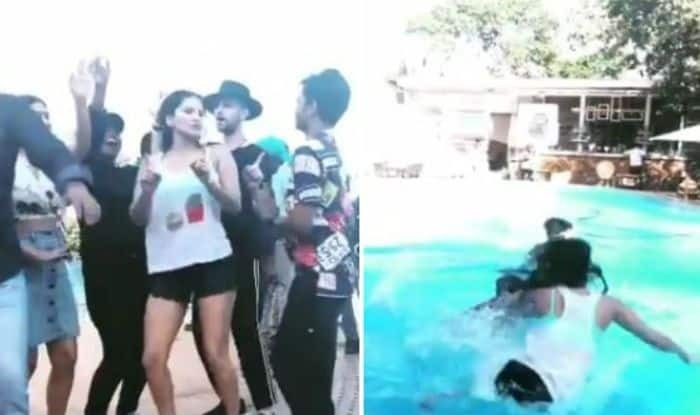 Sunny Leone, who is currently busy with the shooting of her Malayalam debut film Rangeela, recently took to Instagram to share a video where she is seen being the victim of the prank and gets pushed inside the swimming pool. The cast and crew of the film, have some pool time as they push each other inside it and have a fun-loaded day. Dressed in a white tank top and black hot pants, she looks sizzling hot laughing and enjoying her day. As per the description on her post, the prank did not go the way she had planned it but the war is on from Sunny’s side. A few days back, she took to Instagram to share a funny video where she is seen grooving to Govinda’s popular track ‘Aa Jaana Aa Jaana’ along with her crew members. Dressed in a baby pink robe, she has accessorised her look with subtle makeup and curly hair. Well, with Sunny in the video, she definitely steals all the limelight.